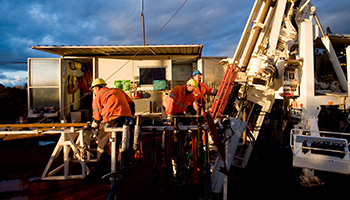 The Drilling Services business of Boart Longyear serves the mining, environmental, exploration, geotechnical and construction industries with client-focused solutions that leverage our global resources, best practices and equipment. No matter what location, what environment or type of service you need, Boart Longyear is committed to providing the same consistent, superior service around the globe. This means you will get the same world-class safety approach, program and performance; the same hardworking, highly trained, capable and productive drillers. And the same well-maintained, modern fleet of equipment. We value every one of our people. They are, by far, our most important asset. That’s why we operate with the utmost in safety and responsibility. We’re working hard to ensure that each employee and customer can go home every day proud of Boart Longyear operations. Our field employees tell us that one of the best things about working for Boart Longyear is the way we embrace and live safety. It’s truly at the top of the list in company priorities – and it earns us incredible recognition from outside agencies and customers alike. Sometimes that means more effort and work to be compliant than at other companies. The end result is its own reward. Employees who have joined us from other operations also point to our quality as a major contributor to job satisfaction. They know that Boart Longyear is recognized “the best” in our industry. Our reputation for leadership is built on the way the company is run – from the projects we win, to equipment that’s maintained at the highest level, to employees who are encouraged to speak out and contribute their ideas. Our Corporate managers regularly visit field offices and work sites. Our goal is to create the superior level of engagement needed to drive and maintain world-class performance. Boart Longyear’s success starts and ends with its people and everything in between that is done to “make life better” for its employees.